An American soldier armed with a rifle and a sailor walk across the tennis courts near the The Naval Hospital at Pearl Harbor. The Hospital was only slightly damaged during the attack. 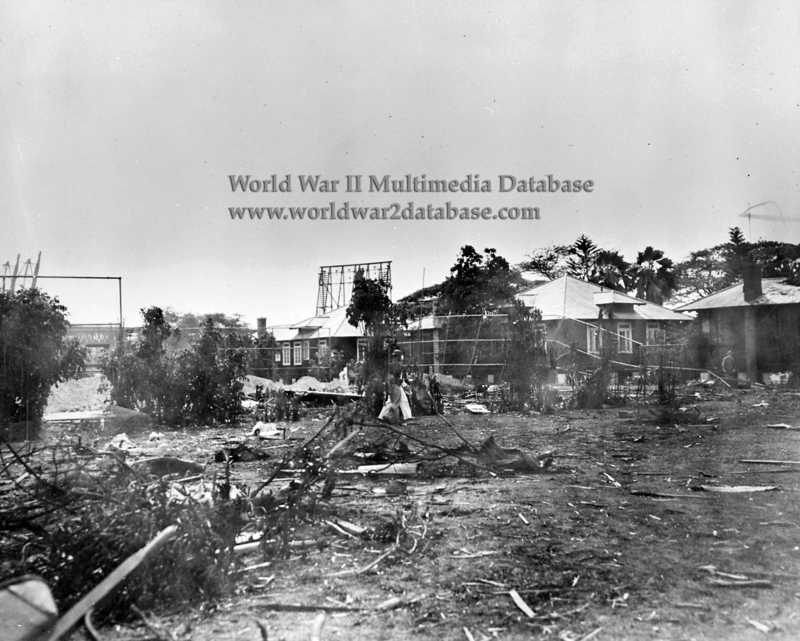 Although located near major military installations, the hospital was not hit by any bombs. The roof of the laboratory building was moderately damaged; about one-half of the animal house was destroyed. The plane sheared off a corner of the laboratory and a number of the laboratory animals, rats and guinea pigs, were destroyed. A vacant quarters building was set on fire by a crashing Japanese Nakajima B5N2 Type 97 Torpedo Bomber, AII-35? piloted by Airman First Class Syuzo Kitahara with Observer Petty Officer Second Class Yoshio Shimizu and Gunner/Radio Operator Petty Officer Second Class Haruo Onishi. The vacant quarters building was virtually destroyed by the fire, but the blaze was brought under control by fire fighters and did not spread to other buildings. The remains of the plane were stripped for souvenirs, some pieces of which now reside in the National Museum of the Pacific War in Fredericksburg, Texas. Pharmacist's Mate Arthur W. Russett (1895-December 7, 1941), who was killed by machine gun fire in the navy yard while returning to the hospital from liberty, was the only casualty suffered by the hospital staff. He is buried in Arlington National Cemetery, near his wife Gertrude (Octoebr 28, 1906 - December 23, 1996) who was also in the Navy Hospital Corps in Washington, District of Columbia. Thanks to David Aiken for his assistance with identifying the Japanese Crew. "Air Raid, Pearl Harbor, This Is Not Drill"